3Xtreme is a racing game released for the PlayStation in 1999. 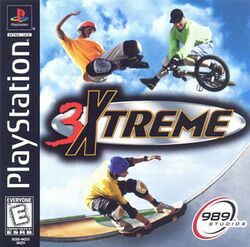 As with 2Xtreme, 3Xtreme contains skateboarding, skating, and biking options to reach the goal before opponent players. Unlike 2Xtreme, however, 3Xtreme's characters are composed of polygons as opposed to sprites. Such a design choice was detrimental to the graphics, however, as the game experienced frequent slowdown when more than one player was on the screen. Players can compete against the computer or another player in several modes of play, including main "Season" mode, exhibition, time trials and freestyle. As in the previous installment, the player races against a field of competitors, although more emphasis is put on performing tricks. Players choose from a variety of tracks, vehicles and athletes, each with their own stats, which makes for a large host of racing combinations. This page was last edited on 26 January 2018, at 00:29.